Purple + Green = Happy Birthday! Sheri has a birthday coming up on Friday. While she prefers to keep things low-key these days, I can still at least imagine the party I would throw in her honor! This is a setting that would also work well for a bridal shower or, with grapes and pears added to the mix, a lovely summer vineyard wedding reception. Varying shades of purple with bright lime green tempered with white would be a welcome sight for the birthday girl and her guests. The setting is simple with relatively clean lines, but it has lots of energetic color. The setting is anchored with a floor-length white table linen that, not unlike an artist’s canvas, shows off that color at its best. 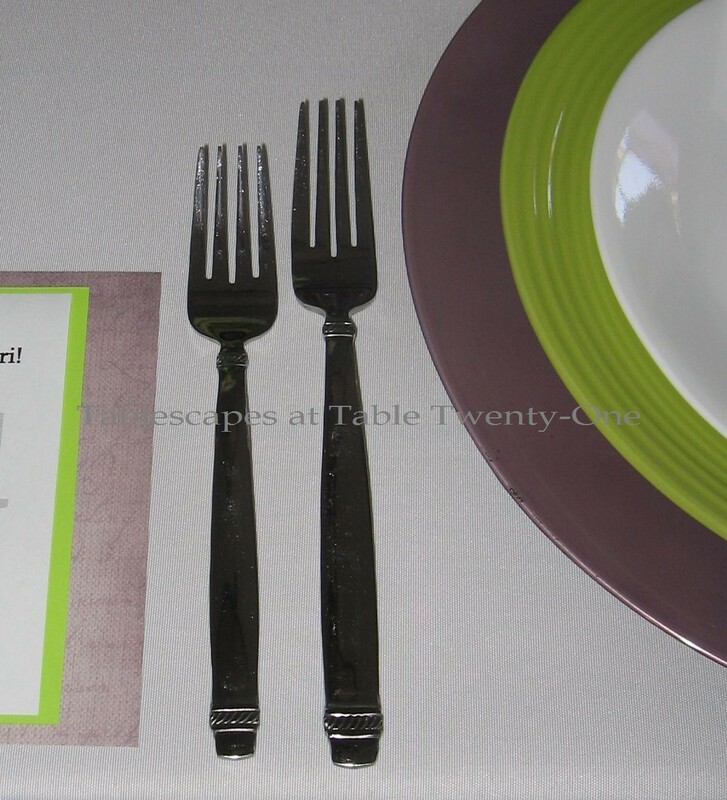 Each place setting begins with an acrylic lavender charger from Michael’s, followed by a lime green dinner plate from Dollar Tree (a great place to really stretch a buck…everything in the place is just $1!!!) and a white Corelle salad plate. You don’t always have to use top of the line dishes and accessories to create a beautiful, tasteful, memorable tablescape! 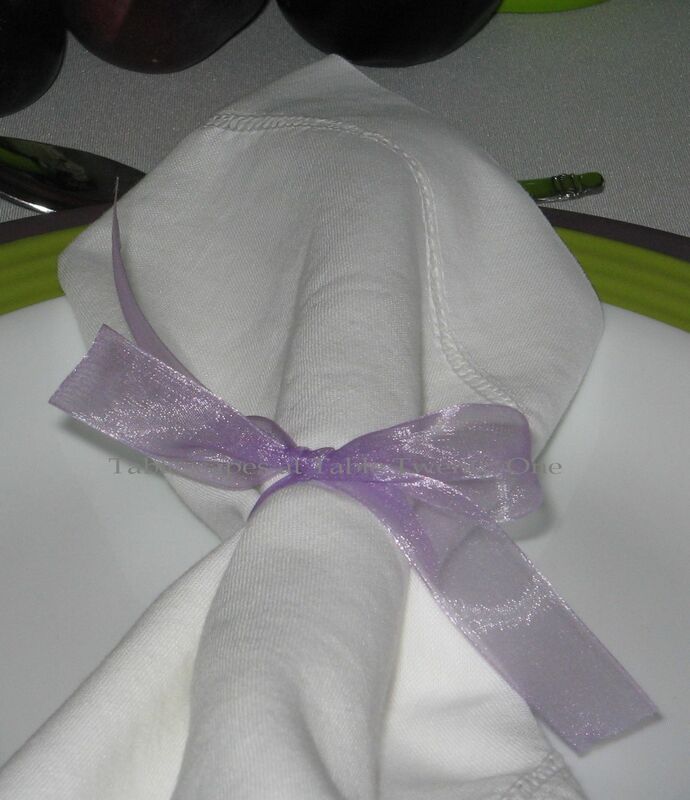 White cotton hemstitch napkins are simply cinched with a length of lavender organza ribbon. The flatware is also kept simple. The only embellishment on it echoes the ridges on the rim of the dinner plate. Sheri and I both love to eat good food. She sometimes phones me to ask, “What do I feel like eating? I know I’m hungry, but I can’t figure out what I want to eat.” I ceremoniously smack my lips and wrack my brain for something tasty that I think will satisfy her taste buds. It actually works about 90% of the time! The menu for her birthday would include food that I know she loves. I created these menus on my home computer using specialty papers from Michael’s and Hobby Lobby. I have waited what seems like a lifetime to use this stemware!!! I love the sultry plum color! The goblets are from Stein Mart, and the fun pilsners are from T.J. Maxx. Sheri has always loved flowers, and there would be no shortage of multi-bloom bouquets at her dinner party to perk up the room! Here, an assemblage of hydrangea, roses, Dutch tulips, acid-green viburnum, and Dutch lilac in simply-styled lime green ceramic vases mixes with a scattering of plums and green apples. The buffet behind the dining table boasts the same colors for the florals and accessories but includes a bit more white. The purple & green floral pots are actually lightweight and convenient-to-store Styrofoam™! I bought them at a wholesale place headquartered in a town just about 35 minutes away from our home. 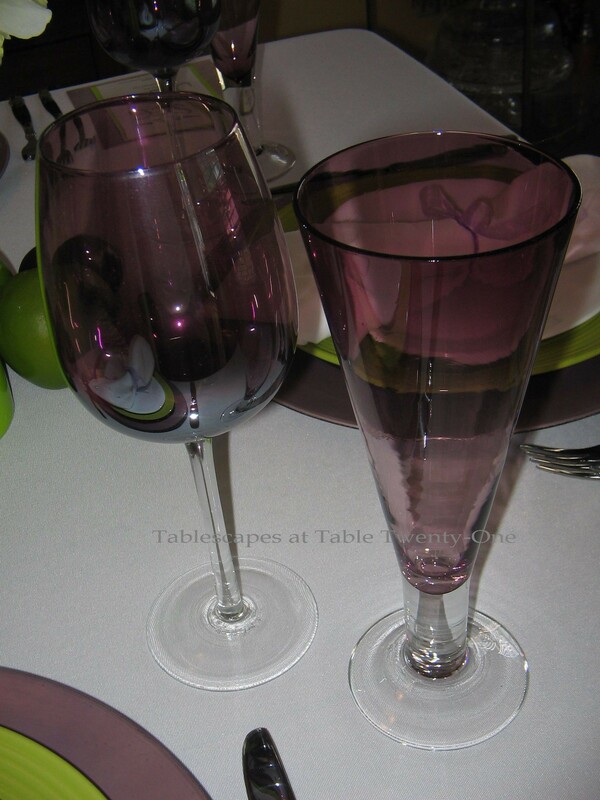 These will come in very handy for future Spring and Easter tablescapes! 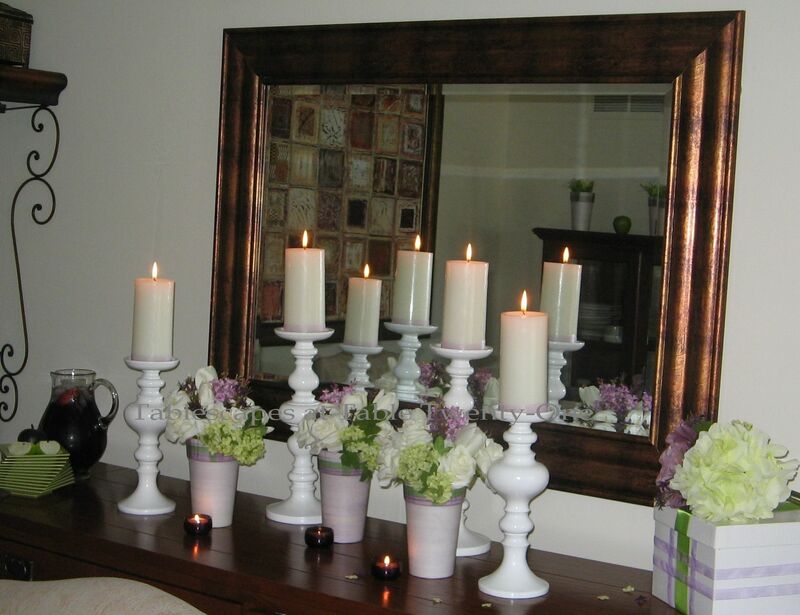 Chunky pillar candles embellished with the same organza ribbon used to tie the napkins are set atop curvy white turned wood Z Gallerie candlesticks. Ask guests to wrap gifts in colors that will complement the decor. 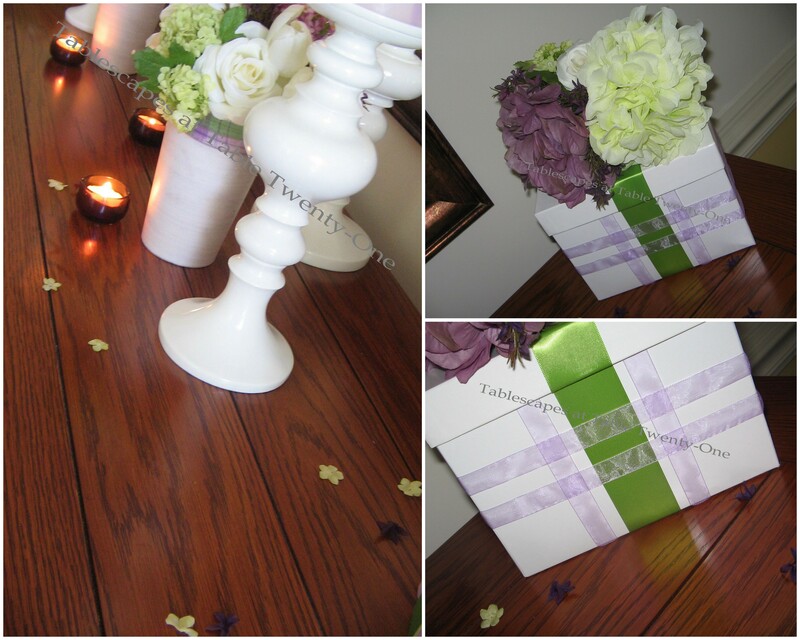 Here, woven strips of lavender organza and lime green satin ribbon dress up a plain white gift box. The box is gussied up even further with a few blooms that match the decor. A plain pitcher is made to look special by the deep, rich apple juice/plum juice/peach nectar beverage created just for this occasion. Slices of fruit always give a little more “oomph!” to beverage displays. 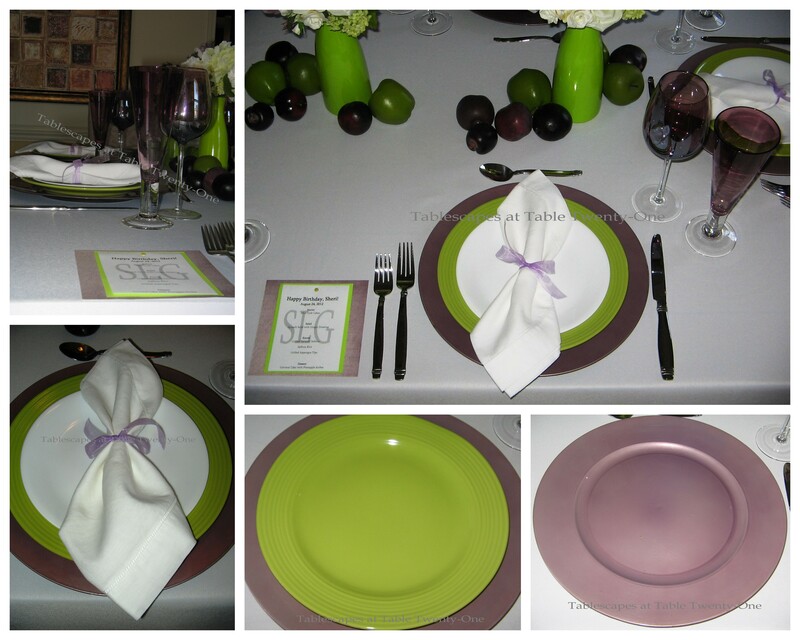 The lime green acrylic appetizer plates are from Target. 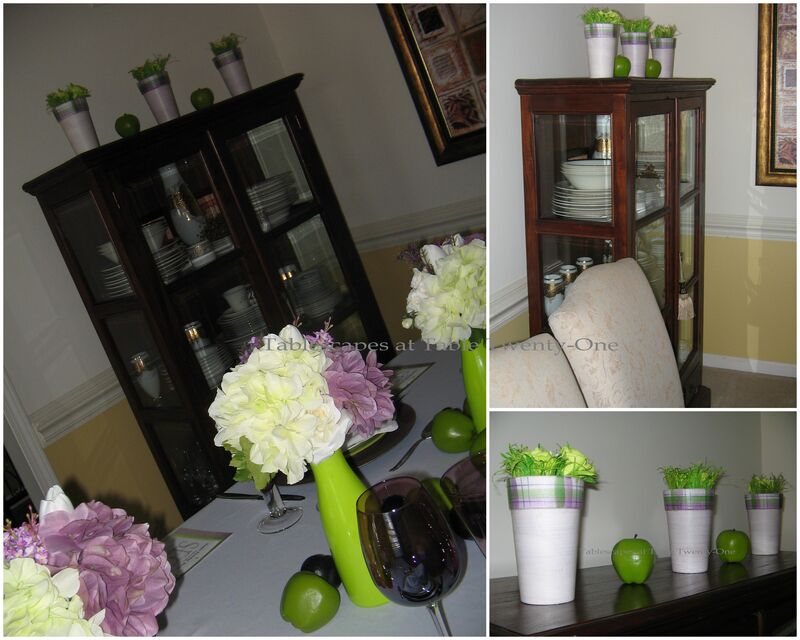 I always like to add little touches throughout the room that complement the table decor. The china cabinet in the corner is treated to the same flower pots as the buffet but filled with chartreuse roses and raffia filler. I will be joining Cuisine Kathleen for “Let’s Dish!” this week along with Susan at Between Naps on the Porch for “Tablescape Thursday“. C’mon by and take a peek at what all the tablescapers from around the globe are up to! This post made me cry! Your tablescape is “almost” as beautiful as your friendship. 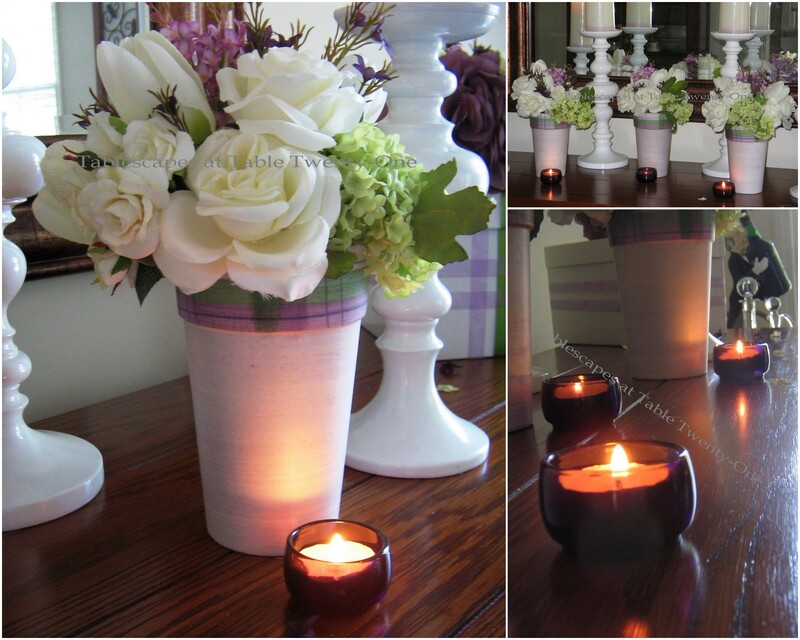 Ok girl, go on with your bad self styrofoam vases (pronouced with a french accent I’m sure) I luv it. You should go on craft wars. It is so great when we have best friends for years mine is a high school buddy. Awwwww! What a beautiful friendship….you are so sweet, having a special birthday celebration for your best friend. WOW, 50 years is amazing. Your color theme is striking. I like the contrast between the two colors. Love the glasses and you can’t go wrong with bargains from the dollar store. 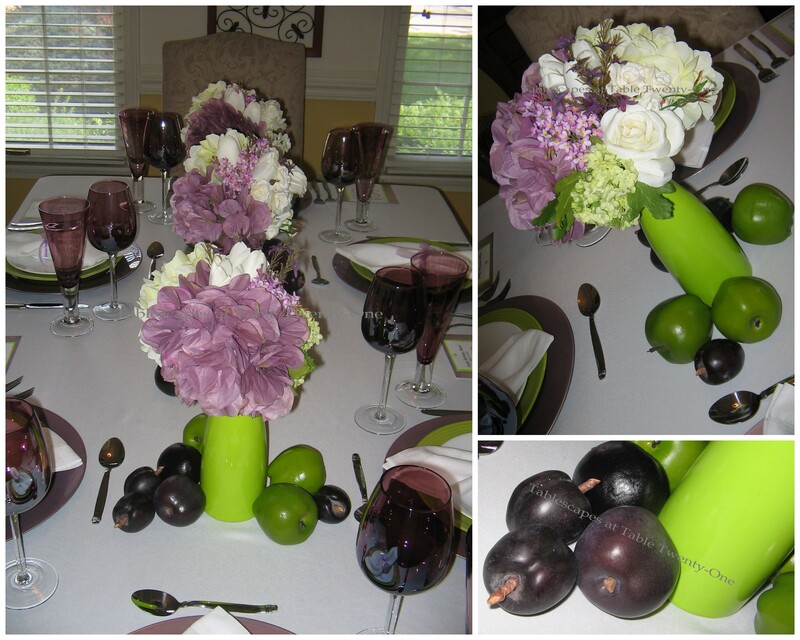 Adding the plums and green apples adds more of your colors and whimsy. The menu sounds wonderful and I like how you made it yourself. It adds elegance to this very special party. Thanks for sharing Alycia. Oh Alycia…this is such a wonderful tribute to your BFF….this truly is a post that brings tears of joy, laughter, and sentiment….You are so very blessed to have each other….I have two friends that I have known FOREVER and cannot imagine life without them. I am sure Sheri is so very honored for you to have such a wonderful tribute to her with your writing and your gorgeous tablescape…I love that song by Queen…the table and buffet are stunning as always…you never cease to amaze me with your incredible talent. Thanks for sharing your story about your BFF…I can just imagine you two together!!! Lime with purple is really stunning, Alycia! Beautiful, beautiful, beautiful! Just wonderful! Your treasured freind and your table! I know that you are aware of how blessed you are and thank you so much for sharing!!!!!!!! Love the stemware and menu. Are you sure that’s you and not me In the black and white picture of the two of you during college days? Oh what fun! Friends for so long…what a blessing. What a well thought out theme and setting! Love the music choices! I’m so into lavender and green these days. Love the collage of all the years and styles!! I’m stealing that quote to put on facebook…. The lavender and lime are great together and I love how you just tied the napkin with a ribbon. Perfect little touch! I should not have read the menu, cause now I’m graving seafood…may have to make a run to the store for something for dinner tonight! A beautiful setting for a beautiful friendship! Thank you sharing. Good friends are a blessing from god. Alycia, I’ve been away for awhile; but I am so glad that I did not miss this post! This is just wonderful! I, too, have had the same BFF since elementary school; and there is nothing like it! 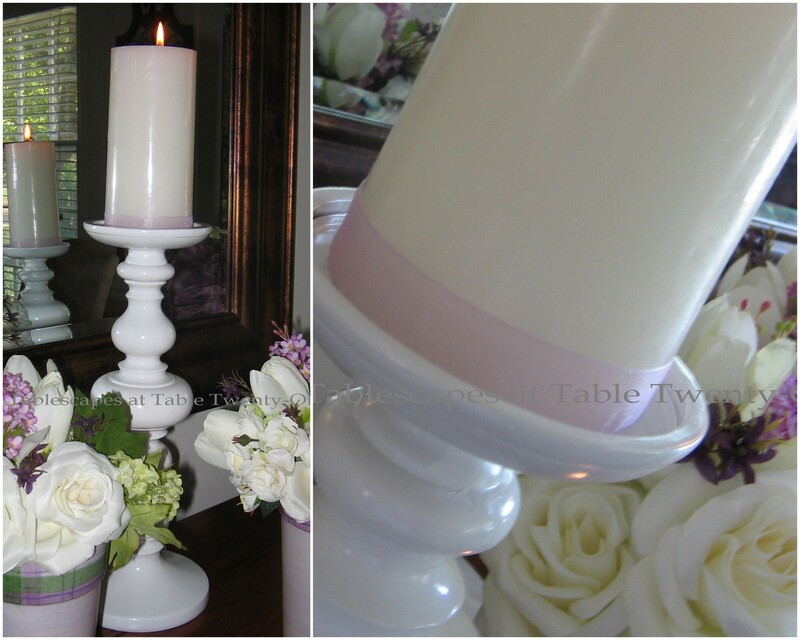 The tablescape is beautiful…I have always loved that color combo. What a marvelous tribute to your dear friend!! Long time BFFs are a blessing! What a beautiful tribute to yours!! Awh…you are such a good friend! Love the collage of you two at the end! What a great table…love that green and plumb coloring! Very stylin’ table! I see you rested…. :-( LOL…. gotta give you a rib…ya know! I love you, too. You’re weird, you’re often obnoxious, and you have a funny-shaped head…but I love you, too! 🙂 Happy Birthday!!! From one SLG to another, I’m wishing her a wonderfully happy birthday. I love the colors you’ve chosen and I have those same chargers. Also trying to figure out how I missed those green dishes at the $$$$ store. Glad to see that you ladies are shovel ready!!! Love the purple and green . It’s funny that opposites attract is true. Norb and I were opposites he liked sports and outdoor fishing hunting etc and we lasted 53 years. Say Happy birthday to Sheri she is lucky to have you for a friend. Happy Birthday Sheri! I have seen you two together and can see how much fun you both have! What a pair and long lasting relationship! Wonderfully blessed you both are! Love the color combo of purple and green. Happy birthday to Sheri! She’s a very lucky gal to have you as her BFF, Alycia. The table (and tribute) are wonderful, and the color scheme is really refreshing here as Summer is thinking about turning to Fall. I love seeing the dark plum color starting to make its appearance! I’m also going to remember the touch of ribbon at the base of chunky candles. That’s a nice detail! As soon as I saw your first song selection, the Golden Girls theme popped into my head. As always your table is gorgeous!! What a lovely table. I think the color combo is perfect! Happy Birthday, Sheri! Alycia, the birthday table would make anyone proud. Love the color combo! Fantastic that you two have been close friends since 1st grade. Longtime close friends are a blessing for sure! Alycia~ What fun! 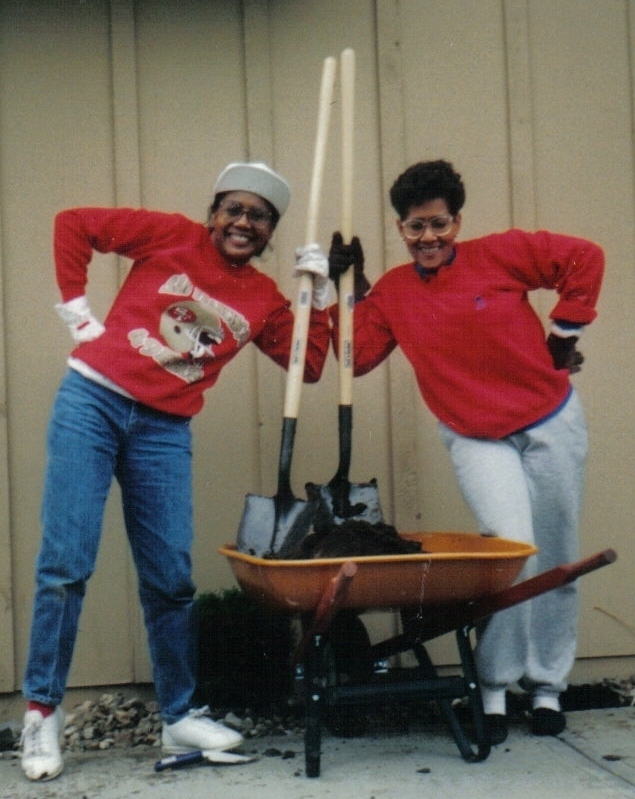 I’m chuckling over your shovel quote and the picture of the two of you, shovels in hand :)) I love the color combination~ I’m a fan of that energetic apple green! I always love when you wrap a package to match your theme or table~ no detail left undone! Happy Birthday Wishes Sheri! Love the party table you have set for your BFF. You are fortunate to still have her. I lost my BFF 8 years ago, and I still miss her so much. She was the hostess with the mostess, and enjoyed parties and beautiful tables just like you. 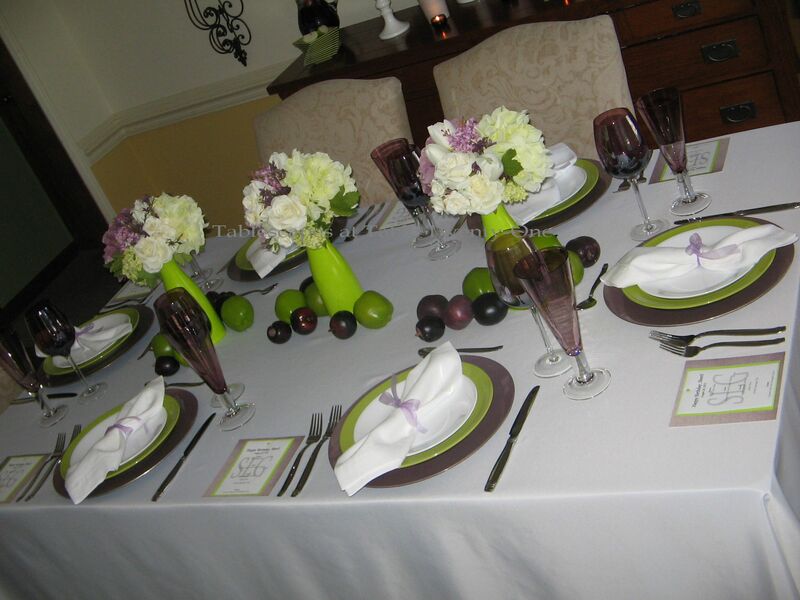 was a lovely and fitting tablescape………….love the purple and green. Your table and your friendship are a beautiful thing. So sweet! I have an old friend since we were 8 — she is retired and living in Florida now. Her health is poor but we stay in touch on FB and she reads my blogs. It was always so weird how no matter how long a time had passed since we last saw each other, we always picked up the conversation like it was yesterday. You and Sherri are very lucky to have this friendship. A great big Happy Birthday Sheri! What a fun table. Since purple is my all time favorite color, I am loving this tablescape! Visiting from Let’s Dish! What a wonderful celebration…birthday and friendship! Love, love, love your tablescape! Those sultry plum pilsners are stunning!!! 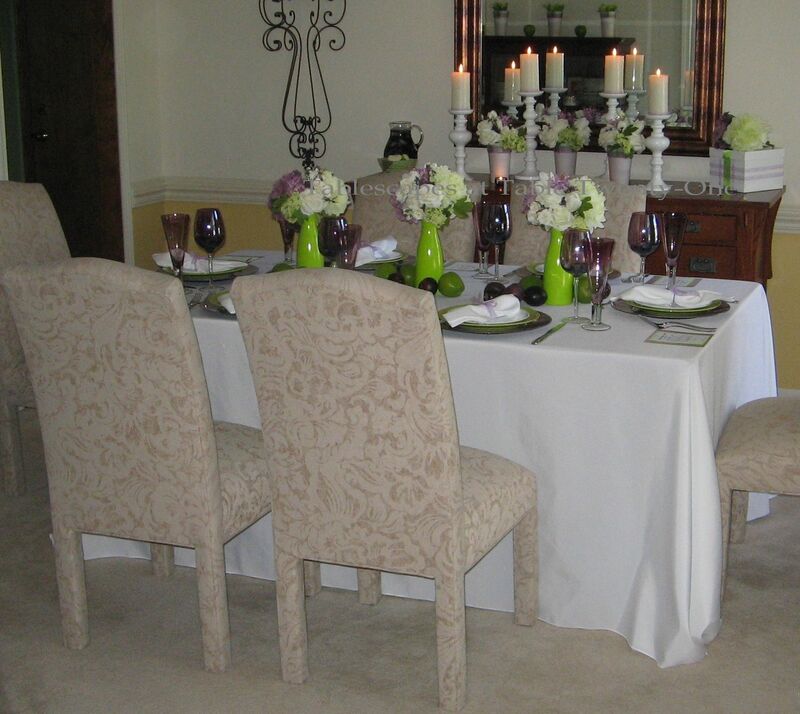 Thank you for reminding us that we can fit a table beautifully without “breaking the bank”!!! I enjoyed your musical selections…but the theme to the “Golden Girls” took it over the top! Visiting from Tablescape Thursday! What a truly wonderful table you have set for your best friend!!! You must be such a lovely person to go to that much trouble. Just perfect, as usual!!!! Love that pic of you and your friend. You can’t go wrong with the Dollar Store for glassware and fun dishes for the table. The menu sounds wonderful!! When you are choosing the music, don’t leave out Feelins! 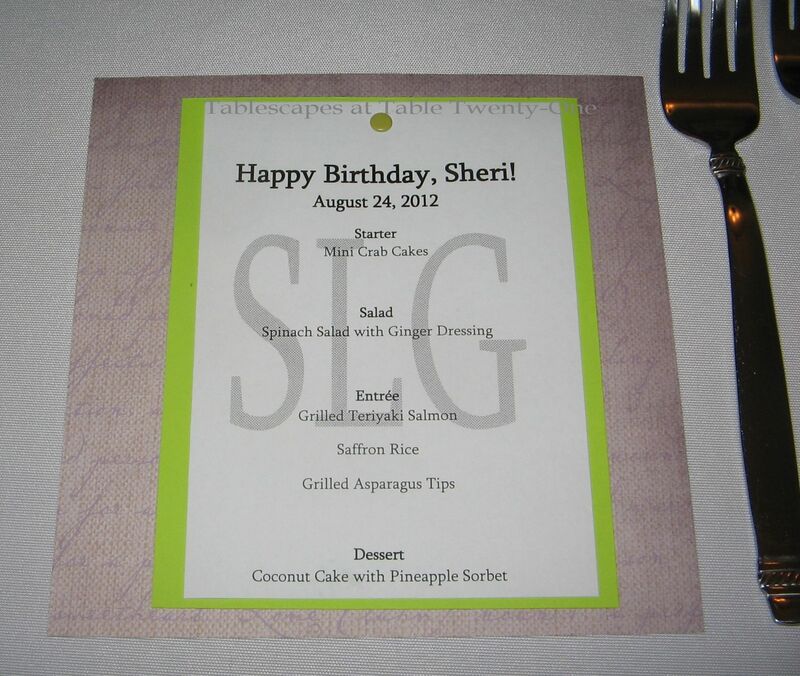 Sheri is likely to be blown away by the thought you have put into her special table, and she just might surprise you and show up to enjoy it on her birthday so you better get cooking! BTW, my b-day is next week, and this would work fine for me, too. You’re da bomb! This is a gorgeous table! I love how pretty purple & green look together. I love the display you used on the buffet. It’s really lovely. 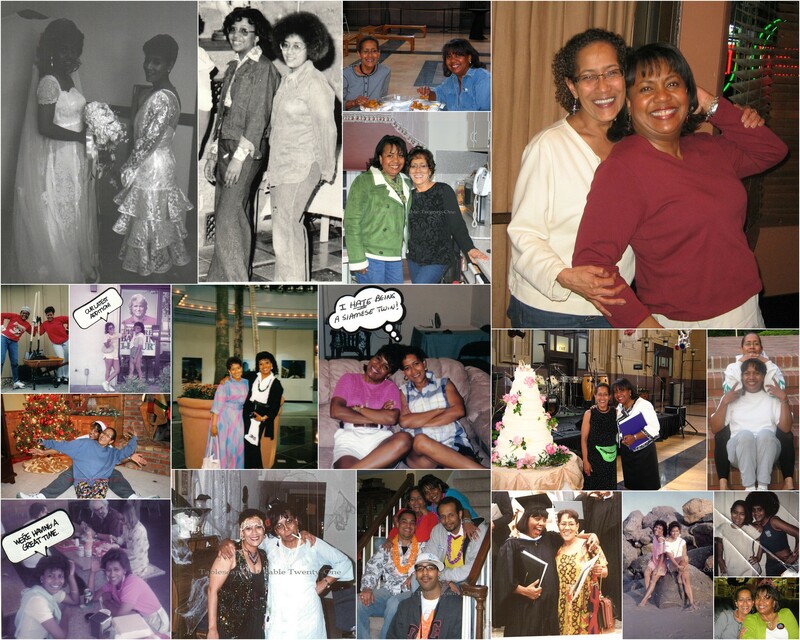 You are lucky to have a wonderful friend like Sheri for 50 years! Happy Birthday to Sheri! I love your attention to details, like the buffet behind the table. How nice to share such a long enduring wonderful friendship!! so beautiful! Your greens and purples are the perfect shades to compliment each other. Your table is just lovely. How wonderful to have such a special friend. What’s not to love? You know how I feel about purple and green! This is a very lovely birthday table. You are all about the details, and the result is wonderful. 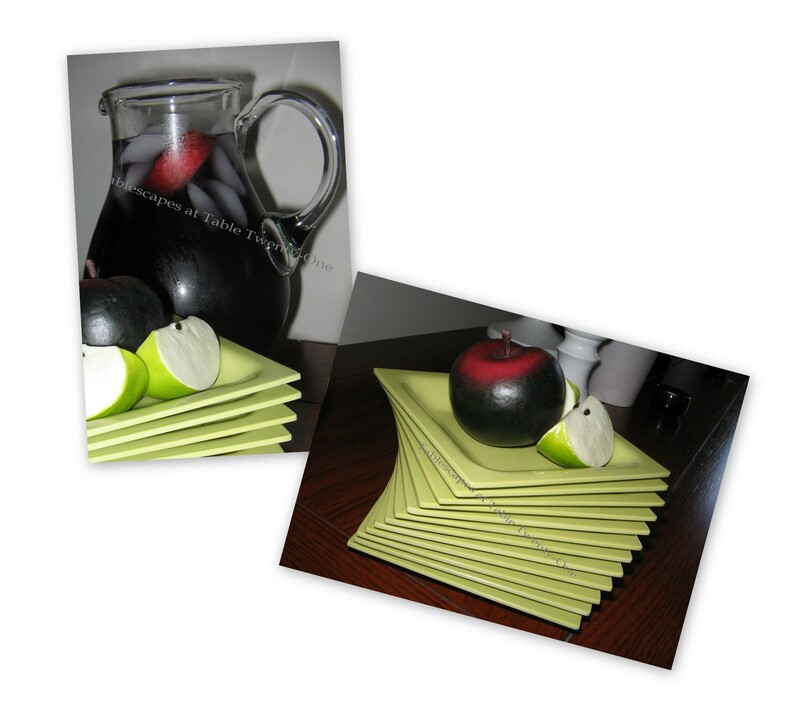 Love the use of apples and plums, and your fruit punch sounds delicious! My mouth is watering over your menu, too! You both are so lucky to have such a long friendship. I will have to check out your photo collage on my other computer which has a very large monitor! Oh how sweet to have a friend for so many years, one you can always count on to keep you going. Love the collage of you two, the hair, the clothes but such a friendship. 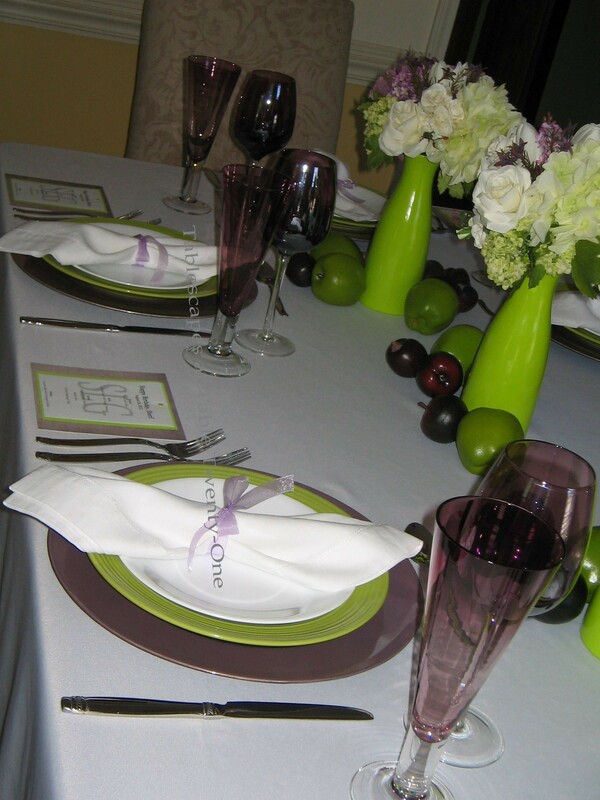 Beautiful table you are setting for your friend, great colors with the purple and green. The green is really popping next to the purple, great choice. Your menu looks delish too. Happy birthday to Sheri and your long friendship. If I were your best friend, these colors would fit me perfectly too. Hope this isn’t too late for you to read it. I have been so busy this summer, I can barely get a post out! I do so miss everyone and hope things will slow down after Labor Day! What a wonderful post! I loved the story and the tables is just gorgeous. Wonderful color combo! The stems are fabulous! You do everything with such style! Hi Alycia! I love this post. It is so sweet that you’ve shared your long-time friendship with us!. In the age of FB and Twitter and are still connecting in work and play as you two do, it is so refreshing and so awesome to see. I’ve known Sheri for a long time but unfortunately for most of it has been from afar–you two are wonderful! To have gone through life like sisters and see “besties” celebrate one another is a beautiful thing. The table is also beautiful. Tell Sheri hello for me.